In the wake of his fifth world title, it's time for us to better appreciate Lewis Hamilton's greatness and achievements, writes Luke Smith. Moments after Lewis Hamilton crossed the line to clinch his fifth Formula 1 world championship in Mexico on Sunday, my phone buzzed with a message from a close friend from outside of the sport. A few years ago, I may have agreed with the sentiment. Hamilton once held a certain swagger; a feeling that nothing and nobody could touch or better him. But not now. Not five-time world champion Lewis Hamilton. This is a very different person. This is a sportsman that we really need to appreciate for the great he is. As Brits, there is a tendency to like our sportsmen to be cut of a certain cloth: the clean-cut family man; the uncontroversial figure; someone who doesn’t dare colour outside the lines, instead perfectly fitting the box they have seemingly been assigned to. And that last point is something Hamilton, particularly in the last five years, has never done. He has never wanted to solely be ‘Lewis Hamilton, Formula 1 driver’. He’s lived a remarkable lifestyle, very much within the public eye, and to many, that has been a negative. A racing driver should do only that: race. Hamilton is exuberant, maybe even a bit eccentric, but he has broken the mould for what it is to be not only a racing driver, but also a British sporting icon. For as much as we may heap praise upon the likes of Andy Murray, Mo Farah, Bradley Wiggins and Chris Hoy (all ‘Sirs’), Hamilton is rarely spoken about in the same breath. It’s a crying shame, for it is difficult to find a British sportsman who has enjoyed the same kind of dominance and form as Hamilton. This is someone who has been at the peak of his powers for well over a decade now, winning at least one race in every season he has raced in. He’s taken on the best of this generation - Fernando Alonso, Sebastian Vettel, Michael Schumacher, Jenson Button - and beaten them all. And he just seems to be getting better. The paddock has also noticed a shift in Hamilton that has allowed him to reach another gear this year. 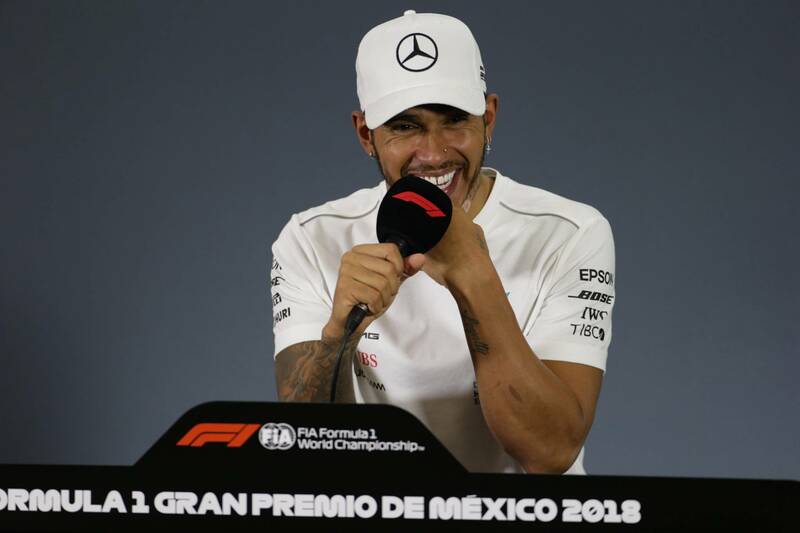 Following the race in Mexico on Sunday, Hamilton spent 40 minutes sat with journalists talking through his title success. At no point did we get even a shred of arrogance. He was a class act showing genuine humility. He is a man truly content with his current position. Hamilton expressed his thanks to all of us attending and for our work over the past year. He didn’t give any great declarations regarding his own status as an all-time great in F1. He didn’t slate his rivals. If anything, he understated things, perhaps a sign of frustration at the difficult race Mercedes had endured in Mexico, leaving him to finish a distant fourth. There was also a very sweet moment between Hamilton and a journalist working for the Daily Mail. The two are known to have gone through a tense relationship through the years, with said journalist’s question to Hamilton on Sunday night in the aftermath of the race being the first he had put forward in a number of years. “I think it’s the first time we’ve spoken for years,” Hamilton said. “So firstly, let me acknowledge that I’ve seen some of the stories that you’ve written this year… and I just want to say thank you for it, and I appreciate the great work that you’ve done.” It was a real sincere moment of gratitude from Hamilton; one that may not have been imaginable in the past. One of the more peculiar moments of the press conference was when the FIA’s media delegate pointed to “the gentleman at the back in the white shirt” to offer a question. That gentleman was Tommy Hilfiger, founder of his eponymous fashion house with which Hamilton has recently launched a line with. “Lewis, congratulations. You are a superstar, and a great human being, and a pleasure to work with,” Hilfiger said. “Lewis is not only a superstar, an epic driver and world champion, but he’s also a fashion icon, and I’m happy and honoured to be part of his team.” Hamilton immediately leapt out of his seat, ran towards Hilfiger, and the two shared an embrace. Hamilton’s had a busy year off-track working with Tommy Hilfiger, but it is something that has only empowered him on-track. “It’s been a special year. I think being able to tap into your creativity is only a positive, there are no negatives about that,” Hamilton said. “Naturally people will have opinions for and against things that you do, but one thing for me is that all of you will know – and I don’t do everything perfectly and I don’t always say the right things – but one thing I do do, is I do me. Only I can live my life the way I live it, and it can’t be steered by anyone else and I try to do the right things in order to be my best. “Having these opportunities to do these other things, tapping into a different part of the mind, naturally doing these things outside a race, and it has nothing to do with being a racing driver, but I think it’s keeping the brain stimulated. “And knowledge is power. When you’re learning new things, when you’re experiencing new things you’re gaining knowledge as you travel the world and I only see that as a positive. We should not tear Hamilton down for having a life and aspirations outside of F1. The argument that it is a distraction is both boring and invalid, with this, his busiest of years, proving it has zero bearing on his on-track performances. But what has been the turning point for Hamilton? What has seen him reach this zen-like state that has allowed him to reach another level in his on-track performances? Hamilton himself identified a number of factors that fuelled his dominance this year: “You’re trying to work on all areas: how you prepare; how you get yourself in the right mindset; how you deliver in the car with your feel; how you learn to balance the car and risk versus reward; how you communicate with the guys who you work closely with, to extract the best from them. 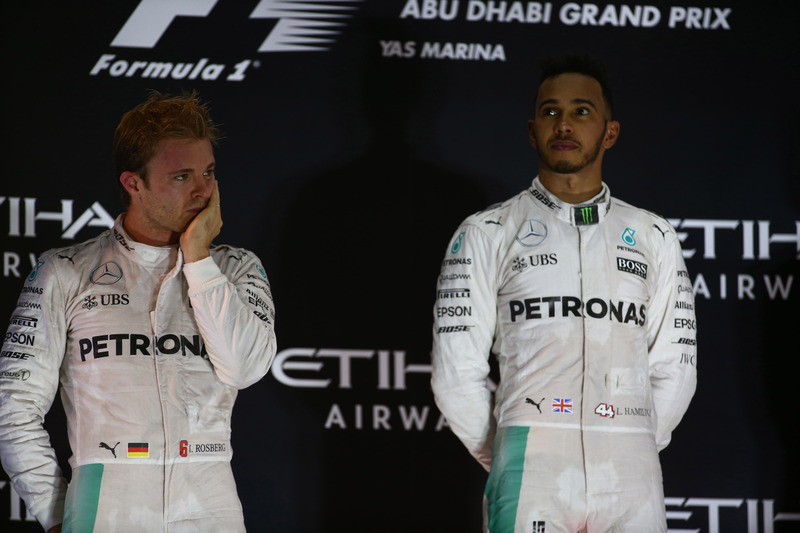 But there is a big element that Hamilton omitted: the lessons that come with defeat, namely that to bitter rival Nico Rosberg in 2016. The circumstances surrounding Hamilton’s title loss that year are well-known, chiefly a lack of reliability at key points and a sluggish start to the year, the latter being down to the driver alone. But it was a real wake-up call. For the first time in his career, when fighting for a championship, Hamilton had lost to a driver in the same car as him. A driver who, in terms of talent, was inferior. This a the trigger that shifted Hamilton, with Rosberg’s departure from Mercedes coinciding at a perfect time. It removed any knots in his head that there may be those within Mercedes - such as those working on Rosberg’s car - that were working against him. It defused the toxicity in the team, giving way to a truly harmonious setting that has allowed him to flourish. “At the moment, it’s very very difficult to imagine or envisage myself anywhere else,” Hamilton said when asked if he would ever ponder a move away from Mercedes to try and firmly establish his greatness in all areas. “This is my family, this is where I grew up - but I said the same thing when I was at McLaren. I think one of the reasons I wanted to move was to go somewhere else and see if you could do something special somewhere else. I knew I could, but I needed to prove it to everyone else. Hamilton is firmly in the conversation to be considered F1’s GOAT (greatest of all time). We may speak warmly of the likes of Jim Clark, Alain Prost, Ayrton Senna, and many other legends of the sport. But none of them performed at the peak Hamilton did so consistently. Michael Schumacher’s records are now well in sight; give him three years, and they could all fall Hamilton’s way. Hamilton has also never got close to the kind of controversy for dirty on-track tactics the likes of Schumacher and Senna did. The fifth title, won with two races to spare against another all-time great in what was arguably the quicker car this year, only strengthened Hamilton’s case to be seen as F1’s greatest. And he needs to be seen in that way among British sportsmen, too. His British critics will poke holes for many things: the accusations of tax evasion, or the fact he spends most of his time out of the country, or that he speaks with a slight American twang at points, or that, as seen in the press conference, he dares to have interests outside of F1. 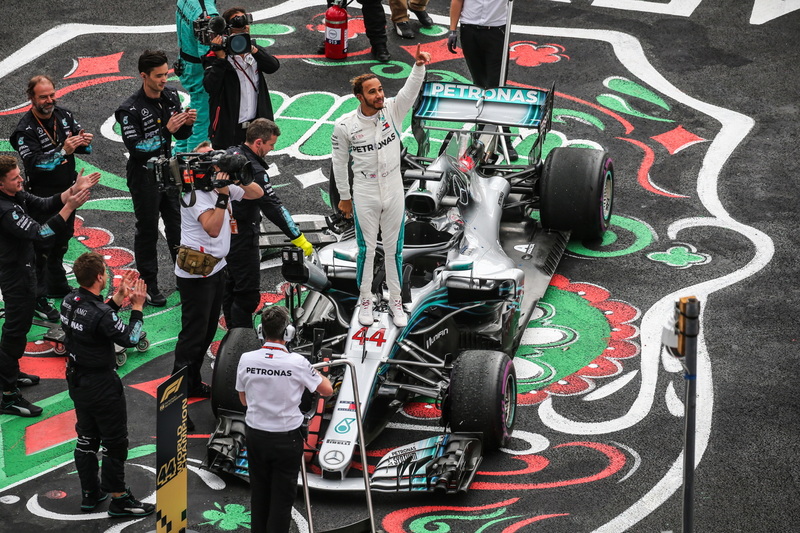 But when Hamilton was asked about the possibility of becoming ‘Sir Lewis’ on Sunday, he spoke with the kind of national pride and heart that is difficult to convey in words. "Honestly that is really not something that is on my mind, and not something I’m even contemplating,” Hamilton said of a potential knighthood. “I’ve been very fortunate and very grateful to have met the Queen on a couple of occasions, which I’m just grateful for. I’m very proud. 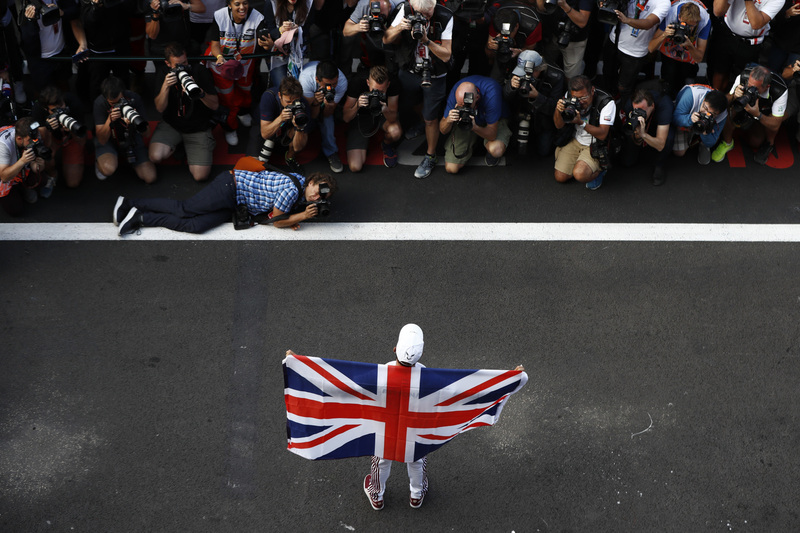 “I don’t know if you notice that sometimes, when I’m on the podium I look back, and see the Union Jack and I’m very proud to raise that flag, and I’ll continue to do so, and hopefully try to make more and more Brits proud. “At the moment, a German has the most titles, but I think I’m quite grateful and quite proud of the ones that we have as Brits.” He took a moment after finishing his sentence, visibly emotional. 2018 is the year that Lewis Hamilton not only established himself as one of F1’s all-time greats, but also one of the greatest Britons to ever enter the sporting arena. We need to give him the respect and credit he deserves, be that via a knighthood or otherwise. Because in 10 years’ time, he won’t be doing this anymore. We have a throng of British youngsters on the march to fly the Union Jack, but will any of them reach Hamilton’s levels of success and, importantly, profile? It seems hard to imagine right now.